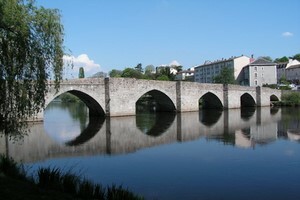 Compare prices on car hire in Limoges from all the major brands and find the best deals. When you book through us, unlimited mileage and insurance are always included in the price given. Limoges is a city in the Limousin region of the River Vienne. Limoges is the capital of the Ministry of Haute-Vienne. Approx. 133,000 inhabitants live in the city, while the suburban living there 174,000 here. Limoges was founded as Augustorium approx. 10 years e. Kr. by the Romans. It has ruins from Roman times. Amphitheater was one of antiquity’s largest of its type in the Gaul. Limoges also has several beautiful medieval buildings such as Saint-Michel-des-Lions, church of the 1400s, Saint-Etienne Cathedral of 1273. In the latter of which was completed in 1888 is the octagonal bell tower, a vision. Bishop’s Palace in the Baroque from the 1700s work today as a museum. Limoges is known for having one of France’s leading porcelain industries. Not surprisingly, both school ceramics and pottery school here. Limoges is also known for its emaljeindustri and emaljemalerier from the 1500s. Among the sights is the crypt of St. Martial, with several burial sites. The nearest airport is Limoges-Bellegarde, eight miles outside Limoges.